Former Vermont Gov. 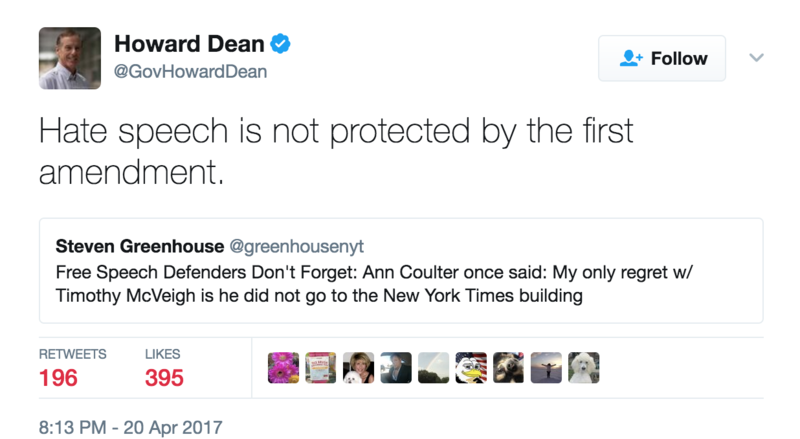 Howard Dean suggested on Twitter that the First Amendment doesn’t protect conservative commentator Ann Coulter. Coulter, who regularly writes for a number of conservative publications including The Daily Caller, is scheduled to speak at the University of California-Berkeley — where left-wing students and agitators are particularly hostile to free speech — early next month. The university briefly rescinded her invitation to speak due to safety concerns about violent liberal mobs which have wreaked havoc at Berkeley in recent months. Dean was responding to a tweet from a former New York Times reporter who insinuated free speech defenders shouldn’t defend Coulter’s right to speak. Dean unsuccessfully ran for president in 2004 and served as chair of the Democratic National Committee from 2005 until 2009. He briefly threw his hat in the ring for DNC chair after Hillary Clinton’s electoral loss before removing his name from consideration.